The special position of the cow in Meo life is manifested in many ways — such as the fact that married Meo women make the sacred batevra (stacks of cow dung cakes), and the community celebrates Govardhan puja. Abid Hussain had just completed his afternoon namaaz at his gaushala (cow shelter) in Nuh district of Haryana’s Mewat region. A devoted manager of the cow shelter, the 23-year-old explained how his day revolved around taking care of the 50 cows now under his care. 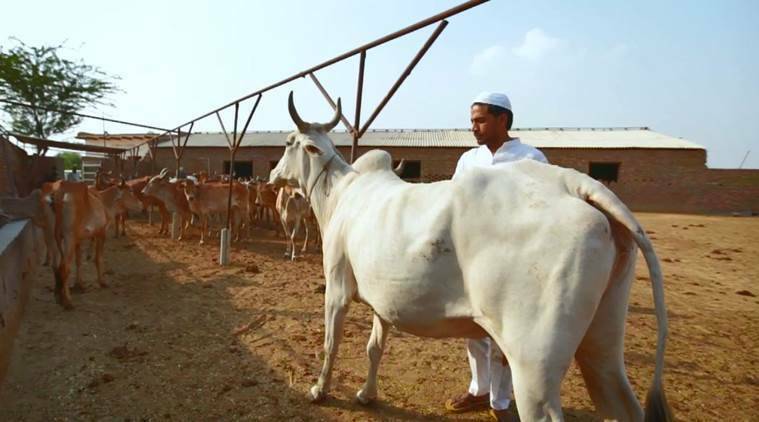 Three years ago, soon after completing his Bachelor’s degree in civil engineering, Hussain decided to take charge of the first Muslim-owned cow shelter in Mewat that his brother, Mohammad Habib, had opened. Since then, his foremost priority is to get rid of the ‘cow slaughterer’ tag attached to his community. “Hum logon ko yeh sabit karna chahte hain ki Musalmaan gau hatyara nahin hain. Musalmaan gau palak hain. Yeh toh sirf rajneeti ki vajah se hum logon ko kalankit kiya ja raha hain (We want to prove to people that Muslims are not cow slaughterers. Muslims are cow protectors. It is just because of politics that we are being targeted),” he says.